Even easier hacking! Makes the bitstream start on top of the target, so you don't have to move anything. Just press the corresponding key and you're done! 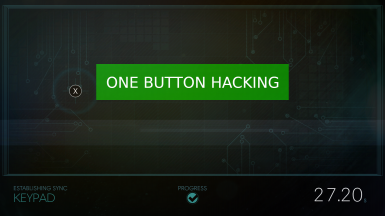 Makes the hacking puzzle require only one button press! Start the hack, then press whatever key it prompts you for, No need to move the bitstream anywhere! To be clear, this doesn't skip the hacking puzzle, it just makes the puzzle require one button press. Please check the "videos" tab to see a demo of the mod! This mod is based on jvarne's PREY Super Easy Hacking mod (with their permission), and also fixes the issue where some level 3 and 4 hacks didn't work. To install, place "patch_one_button_hack.pak" at "SteamApps\common\Prey\GameSDK\Precache".